Tripp Lite's TLP825 offers complete AC surge suppression for comprehensive system protection of workstations, desktop PCs, telecom systems and other sensitive electronics. Heavy grade AC surge suppression shields connected equipment from damage and performance problems due to the heaviest transient surges. TLP825 offers 8 total outlets, 25 foot cord with space-saving angled plug and diagnostic LEDs to warn of wiring problems and suppressor damage. Network grade AC suppression rated at 1900 joules shields equipment from surges and line noise. Integrated child-safety outlet covers safely seal off unused outlets. Attractive white housing with keyhole mounting slots and 3 designated transformer plug outlets offers convenient protection of desktop computer equipment and accessories. Lifetime warranty with $75,000 connected equipment insurance (USA, Puerto Rico & Canada Only). 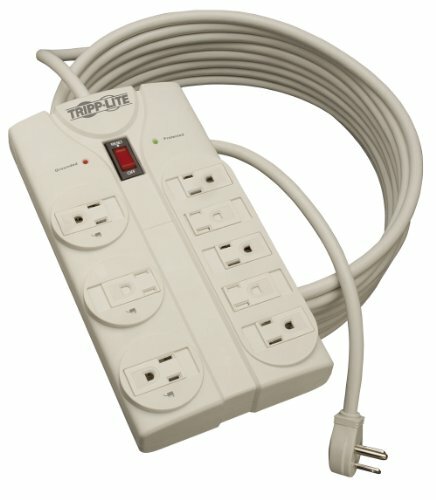 PROTECT ANY ELECTRONIC DEVICE FROM POWER SURGES & SPIKES: Surge Protector with eight outlets protects your PC, personal computer, laptop, printer, scanner, router, phone, fax, modem, television, lamp or any other home/office electronics from dangerous power surges, spikes & line noise. SURGE PROTECTOR WITH EXTRA LONG POWER CORD WITH RIGHT ANGLE PLUG: This surge suppressor provides 8 total NEMA 5-15R outlets - including 3 designed for bulky transformers. The extra-long 25-foot AC power cord acts like an extension cord to give you the flexibility to reach distant outlets, while its right-angle NEMA 5-15P flat plug allows furniture and equipment to be moved flush against the wall to save space in your workstation. SAFETY FIRST! HIGH JOULE-RATING - CONFORMS TO UL 1449 SAFETY STANDARDS: Automatic shutoff cuts power to all outlets when the protection circuit has been compromised. Diagnostic LEDs confirm grounding and protection status at a glance. 1440 joules mean maximum protection for your equipment. Conforms to current UL 1449 3rd Edition safety standards. CONVENIENT OPTIONS FOR PLACEMENT IN ANY ENVIRONMENT: 25 ft. AC power cord with NEMA 5-15P plug provides to ability to reach distant outlets. Surge protector wall mount ability with keyhole slots on bottom panel provides convenient mounting options for wall or desk. LIFETIME WARRANTY, 75,000 INSURANCE: Lifetime Limited Warranty and 75,000 Ultimate Lifetime Insurance covers any connected equipment damaged by a power surge.